Express Circle tour is perfect for travellers with limited time. 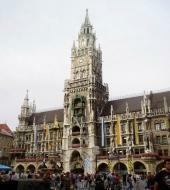 It shows you the highlights of Munich from one of the open air double-decker buses. A complete Express Circle tour lasts 1 hour. Of course, getting on and off adds to the total duration of the tour. Your ticket is valid for 24H . You may get on and off at every stop. Just look for blue double-decker buses.